Assembly Member Ken Skates spoke to passengers about the new Wales rail franchise during a campaign day at his local station. 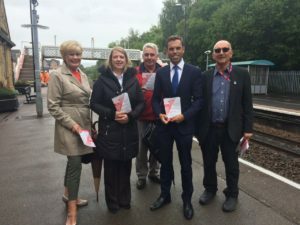 The Clwyd South AM attended the event at Ruabon Station as part of Welsh Labour’s National Rail Campaign Day on Monday (September 3), which aimed to explain some of the benefits Wales’s new rail operator will bring when it takes over from Arriva next month. Mr Skates was joined by Clwyd South Labour Party members and local councillors including Dana Davies (Ruabon), Derek Wright (Cefn) and Frank Hemmings (Chirk North). Clwyd South MP Susan Elan Jones continues to lobby the Conservative UK Government at Westminster to improve disabled access at Ruabon Station. She said: “Improving infrastructure and access at our railway stations is the responsibility of the Tory Government at Westminster, which is why I have repeatedly stood up in the House of Commons and called for investment locally. Last year I presented a petition collected by the wonderful Friends of Ruabon calling on the UK Government to act and support our cause.